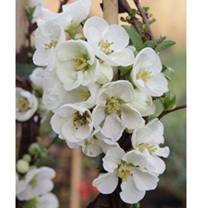 Chaenomeles x superba 'Jet Trail' is a deciduous shrub often grown trained against a wall. It produces clusters of pure white flowers in early spring, which are followed in late summer by green, egg-shaped fruit than turn yellow as they ripen. It will grow in partial shade, and has almost thornless branches, making it easier to train than many other chaenomeles cultivars. Flowers March-April. Height 100-150cm. Supplied in a 3-4 litre pot.